Do you remember when Macri’s government forgave a debt of $ 19,000 million to privatized energy companies? The cancellation of the debt to distribution companies such as Edesur, Edenor, Edelap, among others, was of 19,000 million pesos. This happened in November 2016. It was done by the government of Mauricio Macri. At the same time, a rate hike in electricity and gas began, which today, three years later, adds up to about 3,624% (data from the University of Avellaneda). The policy of benefiting companies and swindling users is more than clear. 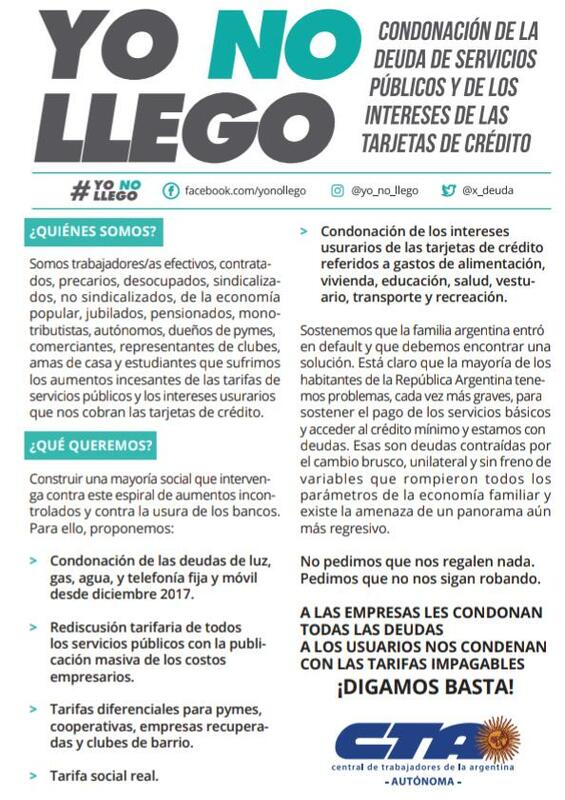 What does the “Yo no llego” (can’t make ends meet) campaign proposes? – Rediscussion of utility prices and publication of business’ profits. – Writing off credit card users’ interests due regarding expenses in food, health, education, etc. Who we are: Workers, unemployed workers, retirees, members of popular economy movements, monotributistas (single tax system taxpayers), merchants, SMEs owners, neighborhood clubs, housewives, students. We are the Argentine people who has been swindled by an energy model of privatizations and rate hikes. ***FeTERA supports the “Yo no llego” campaign.